Clear all 65 jellies and reach 100,000 points to complete the level. This level has medium difficulty. 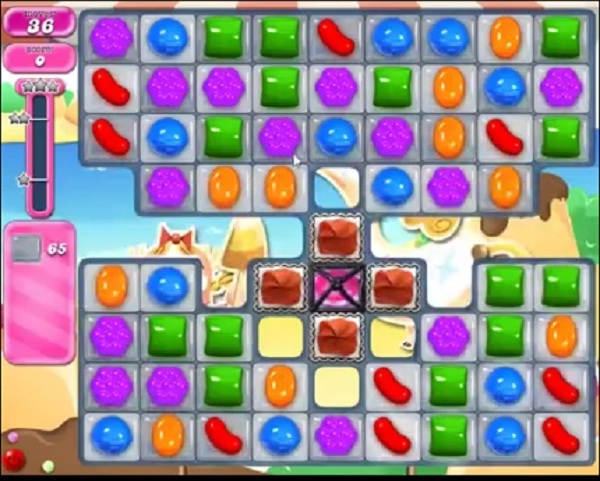 For this level try to play from top part of the board where more candies available to play. Make striped candy and combine them with other special candy to break more jellies. Or play with remaining jelly candy to break more blockers. Again with the ‘medium’ nonsense. I only got 20 moves on my tablet and my PC. Hard as heck level. Bomb/striped combo twice, triggering fish, then wrapped/wrapped to finish off. 1961 completed! 1st board! Make striped candies, release saucer. 20 moves is less than 36 moves!!!! 20 moves is less than your 36 moves!! i am trying unsuccessfully to complete level 1961. The tips show 36 moves and I only receive 20. Can someone HELP! I only have 20 moves not 36…i’d like my other 16 moves and I might get somewhere. This is so frustrating that you cheat us out of moves all the time…..
Only 20 moves , this level !!! !